Maintaining good hygiene can uplift anyone’s morale especially when they are having a bad day. Having the ability to care for oneself or allowing others to have an easier time when caring for you will make good hygiene, simple and quick. Wash basins placed in the right areas for the disabled can do just that. There are different types of wash basins for people with disabilities. The most popular type is the wash basin that can be used by the actual disabled person. The other type is a basin designed to make it easier for a caregiver to use when assisting a disabled person with personal hygiene. Most basins are permanently installed in a bathroom facility that has been purposely built or modified to meet Americans with Disabilities Act standards. Many wash basins may also be designed for use as shampoo basins. Most shampoo basins require the assistance of a caregiver. Such basins typically facilitate a wheelchair-bound person to be positioned at a basin that has a curved shape. Disabled people can then recline into the basin so their hair can be washed. 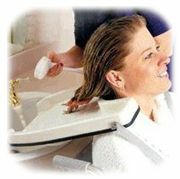 Hair salons use a similar type of basin to wash the hair of patrons without the patron needing to disrobe. Such basins designed for disabled people in a facility or for home use also serve the purpose of facilitating washing other parts of their head. Most are familiar with the elongated wash basin that is typically seen in handicapped-equipped bathrooms. Wheelchair wash basins are permanently installed to a height standard and are a set length for wheelchair bound people to position themselves under the sink for hand washing. Regular sinks are not open underneath. Wheelchair users cannot get close enough to use such a sink because the foot pedals on the wheelchair or their knees will hit the bottom of them. The open design installed at a federally mandated height makes it easier for a wheelchair user to use the sink in a public restroom. Wheelchair Wash Basins – This is a wall mounted ADA complaint wash basin perfect for wheelchairs to roll into. There are portable basin designs for the bedridden. Those basins are prefilled with a specific amount of warm water to wash hair or give a sponge bath to patients who cannot get out of bed for medical reasons. There are usually specific products used when portable basins are needed. The products may contain medications and are chemically formulated to assist in the prevention of skin problems that easily occur with long-term bedridden patients. Before choosing a particular basin for handicapped use, decide if it will be primarily used by the disabled person or a caregiver. It is easier for a person to adapt to using a basin more suited to use by a caregiver than it is for a caregiver to adequately use a basin designed to be used by the disabled person.